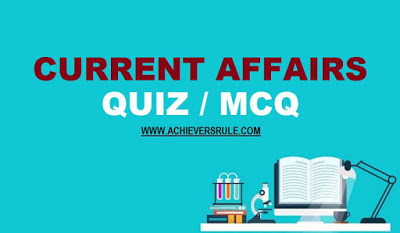 You must solve the Daily Current Affairs MCQ - 18th December 2017 and get ready to face the upcoming IBPS, SSC exams easily. The Current Affairs Set consists of the questions of latest pattern, answers along with explanations that covers all the latest news updates i.e. sports, awards etc. Q1.Marco Polo Del Nero is recently in news. He is the President of which Football Federation ? Q2.Which day is celebrated as Vijay Diwas in India ? Q3.The Indian Wrestling team has won 10 Gold medals at the 2017 Commonwealth Wrestling championship. It was held in ____ ? Q4.The 2017 World Conference on Vedas would be held in which city ? Q5.India has set to join hands with ____ in the field of agriculture and fisheries ? Q6.President of India Ramnath Kovind has laid the foundation stone of the Nyaya Gram project of the High Court of ______ ? Q7.National Workshop on Role of Sakhi One Stop Centres (OSCs) in Strengthening Multi Sectoral Response to Violence was held in which city ? Q8.Who is appointed as the Director of National Institute of Nutrition ? Q9.The National Green Tribunal (NGT) imposed a complete ban on plastic items like carry bags, plates and cutlery in _______ and _______ ? Q10.In which city the head quarter of National Institute of Nutrition is located ? Q11.The 2022 Winter Olympics and Paralympics would be held in ______ ? Q12.Which bank has launched the Sahafat Finance Scheme for the journalist of the state? Q13.The 2nd Edition of Serendipity Art Festival would be held in which state/ UT ? Q14.Who has coined the word "Youthquake" ? Q15.Narendra Modi will launch the ‘MyDoNER’ app and will distribute cheques to start-up entrepreneurs in _____. Explanation 1. FIFA suspended the head of the Brazilian football federation Marco Polo Del Nero for 90 days over a breach of its rules. FIFA ethics committee added that the decision bans Del Nero from any football-related activities during this period, starting immediately. Explanation 2. Vijay Diwas is commemorated every 16 December in India. It marks its military victory over Pakistan in 1971 during the Indo-Pakistani War of 1971, in alliance with Bangladesh Mukti Bahini. Explanation 3. India win 10 golds at Johannesburg (South Africa) Commonwealth Wrestling Championship. The India Greco Roman Style Wrestling Team that represented the nation at the championship won gold and silver medals in all ten weight categories. Explanation 4. Vice-President Venkaiah Naidu will inaugurate a world conference on the Vedas at the Indira Gandhi National Centre for Arts (IGNCA) here on December 15. The three-day 'Vishwa Ved Sammelan' will have in-depth discussions on de-mystifying various myths and fallacies surrounding the Vedas and Manu Smriti. Explanation 5. Indian and Columbia are set to join hands in the field of agriculture and fisheries with an aim to boost the economy and mutual co-operation of both the countries. The Union Cabinet chaired by Prime Minister Narendra Modi approved the signing of a Memorandum of Understanding (MoU) between India and Colombia in the field of agriculture and fisheries. The MoU provides for cooperation in the following fields of agriculture and Fisheries. Explanation 6. The President of India, Shri Ram Nath Kovind, laid the foundation stone of the Nyaya Gram project of the High Court of Allahabad Speaking on the occasion, the President said freedom of the judiciary is a cornerstone of our democracy. India’s credibility is enhanced by a fearless and independent judiciary. Explanation 7. National Workshop on Role of Sakhi One Stop Centres (OSCs) in Strengthening Multi Sectoral Response to Violence was held in New Delhi by the Union Ministry of Women and Child Development (WCD) Around 400 Sakhi- One Stop Centre Functionaries and nodal officials from State Department of Women and Child Development from 33 States/UTs across the country had participated in workshop. Explanation 8. R Hemalatha takes charge as Director of National Institute of Nutrition Hemalatha, a medical graduate from Gandhi Medical College, Hyderabad, assumes office at a historic moment as the institute enters its centenary year. Explanation 9. The National Green Tribunal (NGT) imposed a complete ban on plastic items like carry bags, plates and cutlery in towns located on the banks of the River Ganga like Haridwar and Rishikesh The Green Tribunal also imposed 5,000 fine on those violating the order and said action will be taken against erring officials too. Explanation 10. The head quarter of National Institute of Nutrition is located in Hyderabad. Explanation 11. The Beijing 2022 Organizing Committee (BOCOG) Unveiled the Official Emblems of the Olympic and Paralympic Winter Games BEIJING 2022 at a Ceremony at the NATIONAL AQUATICS CENTRE in the Chinese Capital. Designed by artist Lin Cunzhen, the emblems combine traditional and modern elements of Chinese culture, as well as features embodying the passion and vitality of winter sports. Explanation 12. Jammu and Kashmir Bank on Thursday launched a “J&K Sahafat Finance Scheme” for journalists, editors, employees of newspapers, and media houses. The scheme which will give a maximum amount of Rs three lakh would help journalists to buy equipments without any delay and additional charges. Explanation 13. Second edition of 'Serendipity Arts Festival Goa 2017 'commences in Goa. The festival features a plethora of effects like multiple venues, magnificent stage sets, architecturally built to transform Panjim for audience delight, and seamless surface transport connectivity. Explanation 14. Youthquake' coined by Diana Vreeland named as 2017 word of the year by Oxford Dictionaries. Youthquake”, defined as “a significant cultural, political, or social change arising from the actions or influence of young people”, has been selected by Oxford Dictionaries as the 2017 word of the year. Explanation 15. PM Narendra Modi will launch the ‘MyDoNER’ app and will distribute cheques to start-up entrepreneurs in Aizawl. The Tuirial HEPP and the app has been constructed as a Central Sector Project and implemented by North Eastern Electric Power Corporation (NEEPCO), under the administrative control of the Ministry of Power.